These United Methodist Heroes spent some years in ministry at Nardin Park United Methodist Church. In all things, Bill and Laura Roy of St. John United Methodist Church of Sebring (Florida) are known for expressing their faith and love for God’s people. After six decades of service to the church and multiple relocations, this devoted couple continues to travel in spiritual obedience. The Roys have been active in ministry since their high school days in the 1950s where they met attending church events. “We’ve always been in the church doing something,” says Laura. Bill’s local church work began while the couple was pursuing education degrees at Huntingdon College—a United Methodist-related college in Montgomery, Alabama— when he worked at Fort Walton Beach (Florida) First United Methodist Church as a summer youth director. Before his graduation, the two were married, making a commitment not only to themselves but also to church service. Bill states proudly, “From the time we got married, we have worked together in everything, it has always been a partnership. Serving together has strengthened that partnership.” Early in their marriage, the Roys became missionaries in Japan, where they taught English at Okinawa Christian Junior College. 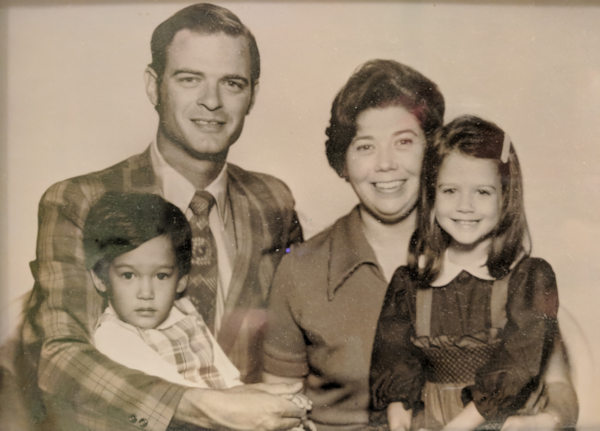 When they returned to the U.S. in the mid-1970s with their young family, Bill took a position as a youth pastor at First United Methodist Church and St. James United Methodist Church in Montgomery, Alabama. Laura, inspired by her time overseas, created stunning Japanese-style flower arrangements made of flora from the family’s yard for the church narthexes. With a heart for youth, Bill later coordinated youth activities for the Alabama-West Florida Conference’s Blue Lake camp and Conference Council on Youth Ministries. In the 80s, the family moved once again for Bill to serve as the youth minister at Nardin Park United Methodist Church in Farmington Hills, Michigan, where he felt a call to minister to the children of those working in the area’s auto industry. Always willing to move where God took them, they relocated to Fort Myers, Florida, where the patriarch served at the city’s First United Methodist Church. After several years, Laura—who had been a junior high school teacher—took on a paid ministry position as an education coordinator at churches in Florida’s Ft. Myers, Tampa, and Sebring communities. “We’ve never had a career. We’ve always done different jobs, but have always come back to the church no matter what,” reflects Bill. “Their love of God’s world and people is always influencing their personal and professional lives,” reflects Kimberly. Now in their late 70s, the couple has retired. Despite this time of respite, their heart for service leads to summers spent as volunteers at Henderson Settlement, a United Methodist mission institution in Frakes, Kentucky. Henderson Settlement offers agricultural education, a thrift store, craft fundraising, and community resources to positively impact families, youth, seniors, new mothers and local churches. The Roys’ role as hosts to work group camps includes helping acclimate more than 2,000 volunteers annually, minding the library, and assisting in the craft shop. The couple is passionate about their summer ministry trips as it encourages them in their faith. “At Henderson Settlement, I enjoy hearing how lives are being impacted through other Christians who are also donating their time,” shares Laura. “I love watching the teenagers interact with the adults that come with them. I also like seeing the relationships built in the local churches,” adds Bill.